2016 Recap: Over 690 Families Impacted! The construction of the classrooms and community center in Canlaon are underway, including the restrooms that were funded through ACF. Thank you to everyone who supported our t-shirt fundraiser and gave to this project, helping us to provide working toilets for a community where many families practice open defecation. We can't wait to visit the center again on our next trip and see all of the children again! You can find more info on this particular project here. Construction progress update as of December 2016 for the classrooms and community center in Canlaon. New, working toilets! The construction of the restrooms are still underway, and will be a wonderful addition for the families in this community. Thank you donors! The 300 families who live in Ecoville were relocated a few years back from their old homes near the foot of the mountain of garbage at the Payatas dump site. While their new community provides certain safeties, it still lacks sufficient access to safe, affordable drinking water. In June 2016, we met with some of the cluster leaders to discuss ways to help educate families on germ transmission and proper hand washing practices. We also set up 6 large water filter stations and, through our partnership with Care Channels International, came up with a plan for the community leaders to take ownership of the project from here and slowly roll out stations in all 30 of their clusters. 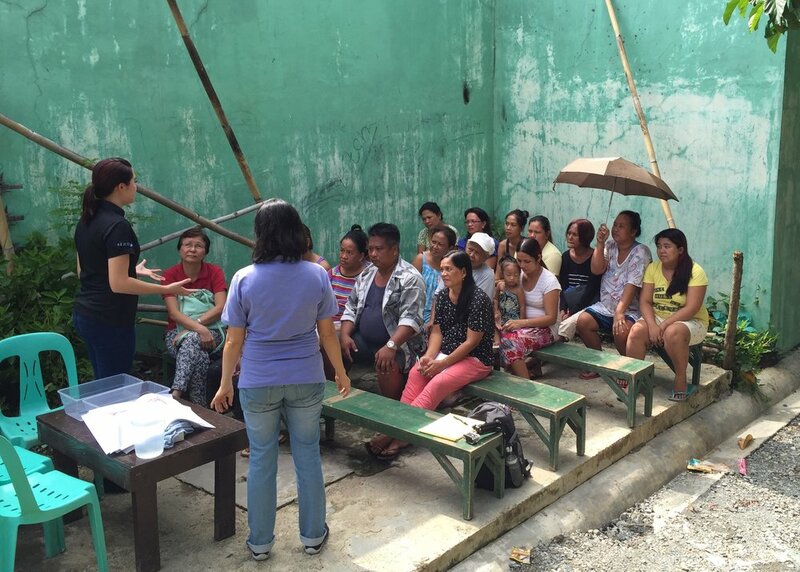 Project20 Manager Kayla Schlaich speaks to community leaders in Ecoville about hygiene and water filtration. Each filter station will provide safe drinking water to a cluster of about 10 families. This year, we had the opportunity to share about our clean water initiative and have others join us in giving specifically to this cause. We were fortunate to be chosen as the charity to partner with Christian Academy in their Giving Project this year! Each week, staff as well as students from Preschool through 12th grade are all doing their part to give sacrificially towards purchasing water filters for families in the Philippines. The middle school and high school students and staff even pledged over $4000! We also had the opportunity to meet with the members of Hale Ho'onani Fellowship, who opened their church and their hearts to hear about our work and give towards our efforts. We are so fortunate to not only be able to share what we do but have others come alongside us in serving those in need! Thank you HHF! Project20 Manager Kayla Schlaich speaks to students and staff at Christian Academy about partnering with ACF. Christian Academy students pledge an amount of their choice to give throughout the 2016-2017 school year. We can't wait for what next year will hold, including new ventures and initiatives -- with our first trip in March 2017! Thank you to everyone who helped to make our work possible this year, and for all of you who continue to support us along with way. Happy New Year! Newer Post2017 Recap: Over 1800 Children Impacted!